I think it is important to have a good dentist and / or periodontist. The problem is finding one you can trust. I wrote about a very good periodontist that I have personal experience with here. These dentists have additional, specialized training in gum health and gum disease. They are exceptional in this field because it is also what they practice on a daily basis. A periodontist can often save teeth that ‘general’ dentists say have to be pulled. However, the consumer has to be on his guard because there is big money in placing implants and even periodontists are not immune to the lure of this type of procedure. If you are told that you need a tooth pulled, be sure to get several opinions. The right periodontist, if you can find her, can often save your teeth. Hard cases will most likely require surgery. The periodontist has a number of techniques at her disposal to replace lost bone tissue. Therefore, do not give in to the idea of getting your teeth pulled unless you are sure that there is no hope. Personally, based on what I know, I’m certain that in most cases you can find a periodontist who will help you if you look hard enough. This is, after all, their specialty. It is best not to lose your natural teeth. Implants have a fairly high failure rate. You often have to wait 6 months or longer before they can ‘try’ again. The jaw will begin to lose bone mass when it does not have a tooth to support. It is a vicious cycle that you should avoid at all costs. Please remember my words: Get several opinions before letting anyone pull your teeth. Dentures and implants are not perfect solutions. Your natural teeth are best suited for your mouth and body. Disclaimer: This post is for information only. It does not intend to provide advice, diagnosis or treatment. If you have or think you might have a health problem of any kind, visit a doctor or dentist for advice, diagnosis and treatment. I am not a dental professional. I started again on the hydro floss – just once a day no more – and this time at right angles to the gum line – using an ordinary mouthwash with dashes of tea tree oil. First day was very bloody. I then used Vogel toothpaste on my sonic brush -threw away the ‘spinning jenny’ just a gum massage and light brush twice daily. Mouthwash is Listerine – the one for gums and teeth – stings like hell at the moment!! I found the xylitol in a shop called Holland and Barrett – but it is marketed overall in the UK as a Health food – (I can see the price soaring) I think there probably is a fantastic marketing opportunity for toothpaste /mouthwash with say a predominant bicarb / xylitol mix plus essential oils -in the UK – and I would be happy to be part of it cos it does work. dont know how to go about it though!! Why do dental professionals tell us that up to 80% of adults suffer from some form of gum disease? I feel like I’ve been misinformed in regards to what it takes to get rid of gum disease or prevent it in the first place. Gum disease is a serious problem, it can cause a person to lose some or all of his teeth. Yet, so many people walk around oblivious to the fact that they have gum disease. Sometimes the professionals that we rely on for our dental care don’t always tell us what we can do to stop or prevent gum disease. Those same people are ready to provide expensive treatments when things get really bad. That age old saying, ‘an ounce of prevention is worth a pound of cure’ seems so apropos in regards to gum disease. When my hygienist and dentist wanted to perform a procedure called a root scaling and planing is when I began to take serious notice of the problems that my gums were having. Up until then, I didn’t really think that I had gum disease. I did not like the sound of the procedure they described to me and decided to do some research and find out if there was anything that could improve my condition without having to go through the treatment. One of the earliest and most effective things I tried was the Hydro Floss oral irrigator. My results were so good with this instrument that the next time I visited the dentist they actually told me that I no longer needed that root scaling and planing treatment and that there was no longer any tartar build up under the gum line. To me, that was exceptional. I could also tell by the look on the their faces that they were a bit surprised too. After a lot of follow up investigation, I realized that sometimes the professionals don’t always know best. For example, when I initially told my dentist that I wanted to get a hydro floss, she said that they were too expensive and that I should buy another, less expensive, oral irrigator instead. I didn’t listen and I bought a Hydro Floss anyway. I’m glad I did. I would buy another one tomorrow if something happened to mine. It’s sturdy and rugged and really holds up. I’ve not had a single problem with it. I don’t know if other brands of irrigators could hold up as well. It constantly amazes me when seemingly uninformed dentists attack the way the Hydro Floss is alleged to work. The theory involves something called ‘hydromagnetics’. I’ve heard and read about dentists who say this is all bunk and there is absolutely nothing to hydromagnetics and that it provides no additional benefit over regular irrigation. I guess those dentists don’t read their profession’s literature very much. A study was published in the The Journal of Clinical Periodontology in May 1993. The study indicates that oral irrigators that use hydromagnetics do a superior job of tartar reduction over non-hydromagnetic irrigators. The differences noted were significant. There is only one oral irrigator that I have found that utilizes hydromagnetics and that is the Hydro Floss. If you have or think you might have gum disease or any other oral health problem, visit your periodontist or dentist for advice, diagnosis and treatment. This article is for information purposes only. David Snape is an avid user of the Hydro Floss. You can read more about this wonderful tool at https://oralirrigatordiscount.com . Dave is also the author of What You Should Know about Gum Disease available at his web site on gingivitis and gum disease. You notice that they seem to be people from all walks of life. As you look around the room, you realize that they could easily be your neighbor, your baker, your dry cleaner, your boss. They are just average people, people just like you and me, sharing a common problem – one that is shunned from all but the most intimate conversations. It is the unspoken, unsung, and truly unwanted ‘something’ that lurks in the darkness. It is hidden away in the closet. It is a shared malady that is so seldom discussed that people tend to think they are the only one with it. No one wants to talk about it. It is such a big problem that an entire industry is built around it. Because it is so seldom discussed, the awareness of it is stifled. Though it runs rampant in a hidden, secretive way, it is everywhere. Virtually omnipresent, it remains in that hazy ether of unawareness. It’s just not on the radar for most people. It does have a name, a plain, simple and unassuming designator consisting of just three syllables: gum disease. How could something with such a humble, innocent sounding nomenclature cause so much trouble for humanity? Yet, it does. Those people in the waiting room would be surprised to learn just how many people do have it. What a shock to discover that your neighbor has implants or your mailman has dentures. So many people are affected, suffering silently. Who would want to talk about it? Why should it even be brought up? It’s just one of those unpleasant, inescapable facts of life that you must endure. Or is it? No one is quite sure how many people have it or will get it. Statistics vary between forty and eighty percent of people. 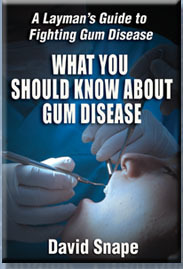 One medically oriented website says that 95% of people 65-years-old and beyond have gum disease. But it can strike much younger and often does. Even children can get it. Like many people, I was shocked to learn that I needed a SRP treatment. SRP stands for ‘Scaling and Root Planing’. SRP is a deeper cleaning that involves scraping and smoothing the root surfaces in order to get rid of built up plaque and tartar. Unpleasant? Sometimes they need to give you anaesthetic to get through the procedure. After painstaking effort and long hours of searching, I finally found success in hunting down answers and an alternative to the SRP treatment. My hard efforts paid off for once in my life. Today, because of my commitment to maintaining dental health I make frequent trips to the periodontist’s office. That’s where I see them – the other patients. These are the people who know. But what about the others, the people who don’t know what lurks in the closet? They are everywhere. I get my teeth cleaned about once every two months. I find this works well towards keeping my gums healthy. Even with this frequent cleaning schedule and excellent home care habits, I still routinely see 4mm pockets. Anything above 3 is considered a problem. Yet, my problems were much worse a few years ago. I felt isolated. Because so many people have gum disease, but no one talks about it. Have you ever felt alone in a room full of people? I found some simple answers that really should be common knowledge. However, like gum disease itself, those answers have remained hidden outside the realm of mainstream knowledge for some unfathomable reason. Professional care is important. But without good home care procedures, just going to the dentist won’t be enough. This is where my detective work paid off. I found the home care solutions I was looking for. No man or woman is a rock and no one is an island. If you or a loved one has gum disease, you are not alone. Start with professional care at a periodontist’s office and do everything you can to discover the home care methods that can help save your teeth and keep your gums healthy.